In January 2016 the Hawaiian Commercial & Sugar Company (HC&S) announced it was shutting down their sugar cane operations by the end of 2016 This announcement was met with mixed emotions. There are those who have been clamoring for HC&S to end its cane burning operations, citing environmental and also health concerns. There are also those who see cane and the traditional form of harvesting as a way of life, of how Maui (and Hawaii) used to be, and want it to carry on for tradition. I don’t think anyone really thought a complete shut-down would happen with this cane field. The sugar cane on Maui happens to be (or was) the last remaining sugar cane operation in the Hawaiian Islands. The sad reality is that HC&S had been losing money for a while now due to commodity prices and competition from other markets and they are now choosing to completely change their business. For the past ten months, HC&S has been harvesting all its existing sugar cane fields (all 36,000 acres of it, mostly in the valley between Haleakala and the West Maui Mountains). Usually they would burn a field, drag the burned plants into rows, then with giant grapples lift the cane onto giant trucks and haul it to the Sugar Cane factory to be processed. Then they would prep the fields and replant. Together with irrigation and sunshine, the new green cane would grow quickly. This process would be repeated every two years. This past year the harvesting is continuing, but there is no replanting as the fields are being left as they are. New growth is happening from residual stalks (the fields weren’t worked up), but since HC&S isn’t irrigating, there isn’t much growth, or green. A month ago I returned to Maui from a short Oahu trip. It is really quite shocking to fly in and see the valley brown. So far I haven’t noticed any major dust storms. 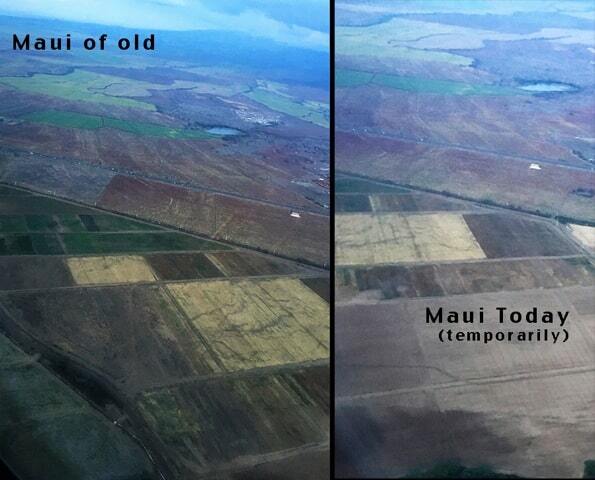 So what’s the plan with Maui’s old sugar cane fields? 4. There will be some fields that are allowed to lie fallow. Personally, I hope that they start the transition sooner than later. In the meantime, check out the Sugar Cane Museum on Hanson Road across the way from the Sugar Cane Factory to learn more about Maui’s history and how sugar cane is harvested. This is great for history buffs, and also the (rare) rainy Maui day. Another place to learn more about sugar cane is by taking a tour of the Ocean Vodka farm and distillery. They grow an astonishing variety of sugar cane types on their 80 acres property. Who knew more than potatoes goes into a vodka?